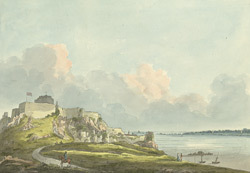 View of Mount Orgueil Castle by G. Heriot. Mount Orgueil Castle was built in the 13th century to protect the island of Jersey against French invaders. It was built on the highest part of a rocky peninsula three sides of which are enclosed by the sea. The castle received its name from Thomas, Duke of Clarence who visited the Channel Islands whilst at war with Normandy. He was so impressed with the Castle position that he named it Mount Orgueil or Mount Pride. It is also known by the name 'Gory Castle'. The castle walls were built out from the rocks and its foundations were a base of granite- meaning it was very strong and very difficult to damage.